Todd and I figured the tent would be crowded, and we were right, though we did snag a couple of seats amidst folks of all ages who seemed sweet and supportive and down-to-earth enough to shout out variations on Jell-O salad. More on that later, but the demo was on how to make black and white cookies which they did as they gave tips on techniques and ingredients (they always use Valrhona cocoa powder) and told stories about how they collected recipes for their new book. 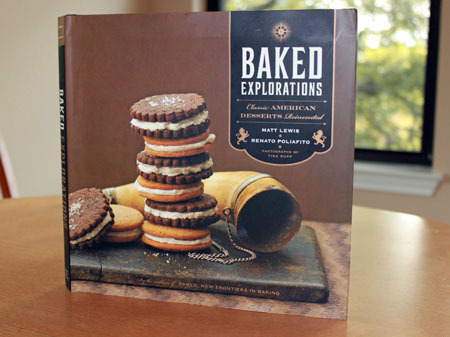 Baked Explorations is a collection of recipes inspired by their travels around the country. Wherever they went, people were always mentioning long lost recipes. The goal of Baked Explorations was to put all those recipes together, modernize them with steps such as taking out lard and/or incorporating their beloved stand mixer and adding ingredient twists. With photography just as gorgeous as that of their first book, Baked Explorations includes variations on Mississippi Mud Pie, Salt & Pepper Sandwich Cookies, the authors’ version of Devils Cake, an Orange Creamsicle tart, a very intriguing pudding type bar called Aunt Sabra King’s Pudding Bars and the aforementioned Jell-0 Salad which their editor didn’t want in the book but which they slipped in anyway. I like Matt & Lewis. They are not only smart enough to run a successful business, but talented bakers who can teach without intimidating, avoid pretentiousness and make you want to run to the kitchen instead of away from it. That, plus they are truly creative with their twists on recipes. Next time I’m in Brooklyn, I’m going to try to make it all the way to Red Hook to visit the store. Or maybe Charleston, which they mentioned has a customer base with a sweeter palate. It was great seeing them and I’d pay full price for one of their books any day! The question is what to bake first? What a cool event! I’ve been routing for the Baked baker on Top Chef pastry. Definitely going to be checking out that Valrhona cocoa powder! I Googled those Nutella scones. Must try those! 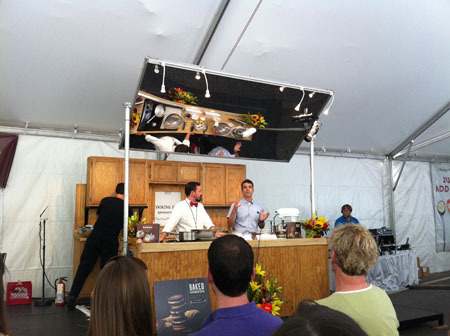 I got to see these guys at their class at Central Market the Friday before the festival, and I really enjoyed it. They showed off 5 of their recipes in that class. (I posted on my blog if you’re interested.) I plan on making the Caramel Apple Cake this week and can’t wait to try out more of their recipes. I also made it to the AB book signing on Saturday. I’m so jealous, there are all these awesome book tours and signings going on and none of them near me. Sigh. I guess Canada just isn’t the place to go, eh? The bakery is wonderful and definitely worth visit if you can! Can’t wait to get this new book of theirs. The sweet & salty brownies are fabulous. And those pudding bars are on my must-try short list . . . The Baked boys will be here, at my local book store, on Wednesday, & I Can’t. Wait. Karen, that one is on my list. It looks like a recipe where you can really taste the Nutella. Jenine, I missed seeing AB at Central Market. I saw him a long time ago at Book People and he was super funny. Maybe I’ll catch him somewhere else. Sue, yes! They were making New York Black and Whites. They told a funny story about how one of their bakers once made 200 for a wedding and accidentally iced them on the wrong side. They ended up making all the cookies again and put the mess-ups in the bakery conference room. Having iced Black & Whites on the up side, I got a laugh out of that. You are suppose to ice them on the flat side. Were they making black and whites as in NYC black and whites? I’ve never had one of those cookies, but I do have several recipes for them. I’ve never made them since I have no idea what they’re “supposed” to taste like. Today I have back of the chip bag CCC’s in the oven as well as some oatmeal bread. We’re going to see the “kids” later today and I thought they might like a little taste of home. Cool! This book looks good. I’m going to have to check it out. We didn’t make it to the main Texas Book Festival venue but we did make it to the signing for AB at Central Market. How funny, I just made their recipe for Nutella Scones, which ran in my local paper this week. As soon as my sleepy teenager wakes up we will eat them. They smell heavenly. All of the recipes I have tried from Baked have been terrific.